Sponsorship is a gift in and of itself, anything additional to sponsorship is just that much more of a blessing! Whether it’s a financial gift or a present shipped in the boxes for you sponsored child, each gift is so special. We carefully ensure that every gift sent is received by the proper child. You will even receive a thank you note and a picture from your child with their gift or the items they were given funds to purchase. 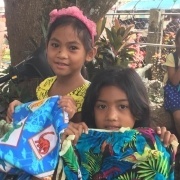 Special gifts for occasions like Christmas, their birthday, and school starting are a treat to sponsored children. Many sponsors choose to send items or give money for those events. However, there is no obligation to give anything in addition to your sponsorship payment. Gifts help create a special bond between sponsor and child, and they also help meet additional needs that cannot be covered with sponsorship. If you would like for LCW to include your gift in one of our shipments to LCP, please send it to the LCW Office address (P.O. Box 37 Barnesville GA 30204) in clear ziplock bags with the child’s name on the outside of the bag. Please include a list of items in the gift and the cost for your in-kind receipt. Please also include a donation for the shipping fee with your gift. LCW ships the first of March, August, September, and December. These shipments take 2-3 months to reach LCP so send your gift in the shipment that will ensure its arrival at the desired date. DO NOT SEND GIFTS BY MAIL DIRECTLY TO CHILDREN. This violates our direct contact policy, and also places a financial burden on the family because there are fees associated with receiving a package. If you send packages directly, the child/parent will be charged a customs fee to receive the package. Often the customs fees are expensive and the child’s family most likely will not be able to pay this amount and will not be able to receive the package or they will be forced to use the money they receive from sponsorship to pay the fees. Money is always appreciated since the families can purchase most of their needed items in Dumaguete. Money for gifts can be sent to the LCW Office and it will be wired to the Philippines in the next monthly transfer of funds. Money given as a gift for a child will be used specifically for what the gift is intended to be. For example, if you specify to buy a new pair of shoes and school supplies, then those items will be purchased. If there are remaining funds, that money will be used for the family’s greatest need listed in the Child Annual Progress Report or groceries. Money is never given without specification for its use. DO NOT SEND CASH OR CHECKS TO THE PHILIPPINES. Cash may be stolen and checks cannot be cashed in the Philippines. Again, this violates our direct contact policy, and money that goes directly to the child cannot be monitored to ensure proper allocation. Your gifts matter! We work very hard to ensure that every gift is received with love. Thank you for giving the gift of sponsorship, and thank you for going above and beyond and giving additional gift. You are truly a blessing. Read more on the Donate page.